W. Stewart Agras, an Emeritus Professor of Psychiatry at Stanford who still heads an active research program, has played a major role in the world of empirical clinical research in eating disorders. Over the years he has designed, implemented, participated in, been a consultant to, and critiqued large numbers of rigorous, cutting-edge treatment studies. These have ranged from inpatient to outpatient interventions, and have employed medications and CBT for anorexia nervosa, bulimia nervosa, and binge eating disorder. As such he is eminently qualified to know evidence-based treatments when he sees them. As part of the distinguished Oxford Library of Psychology, Dr. Agras has edited an exemplary Handbook, recruiting a distinguished international array of authors to provide up-to-date reviews and syntheses. The 27 chapters are organized around phenomenology and epidemiology, approaches to understanding the eating disorders (ranging from basic genetics and biology through developmental psychology and culture), assessment of eating disorders in the context of their numerous medical and psychopathological comorbidities and, risk factors in relation to prevention and treatment. In line with core concerns that Dr. Agras describes at the outset, the book includes discussions about a variety of controversies and boundary problems involving diagnoses, such as in eating disorders not otherwise specified, or EDNOS, the relationship of eating disorders to obesity, genetic and familial influences in eating disorders, developmental issues concerning eating disorders in children and adolescents, and many others, particularly controversies concerning evidence-based treatments and the quality of evidence going into current recommendations. Although EDR readers are obviously interested in all of these topics, and all of the topics are very well done and individually citable, I found the treatment sections to be particularly noteworthy. In addition to excellent individual reviews of CBT, IPT, DBT, family therapy, pharmacotherapy, and self-help/stepped care therapies, Phillipa Hay and Angelica de M. Claudino offer a sophisticated synthesis of evidence-based treatments for the eating disorders (some of which related to Cochrane reviews in which the authors have been involved). Based on these reviews they offer several algorithms for assessment and evidence-based treatments of anorexia nervosa, bulimia nervosa and binge eating disorder. Scott Crow and Nicholas Smiley provide an informative discussion of costs and cost-effectiveness in eating disorders, topics of interest to health planners as well as to patients, families and clinicians. Dr. Agras caps the volume with a chapter underscoring research gaps, pointing to future studies. 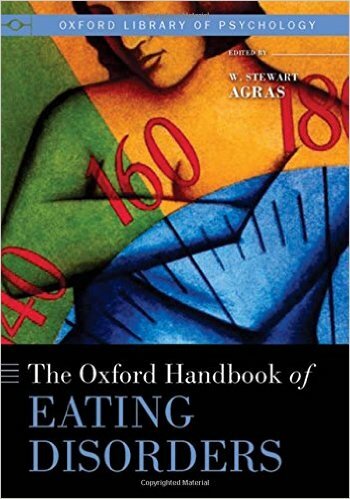 In all, this high-quality volume will be a welcome addition to serious libraries on eating disorders. Clinicians will find outstanding and discerning summaries of the literature in all of the areas covered.